Summary: If you have great interest towards the temples of Lord Shiva, never forget to make your visit to the Kotappakonda hill during your visit to Guntur District. 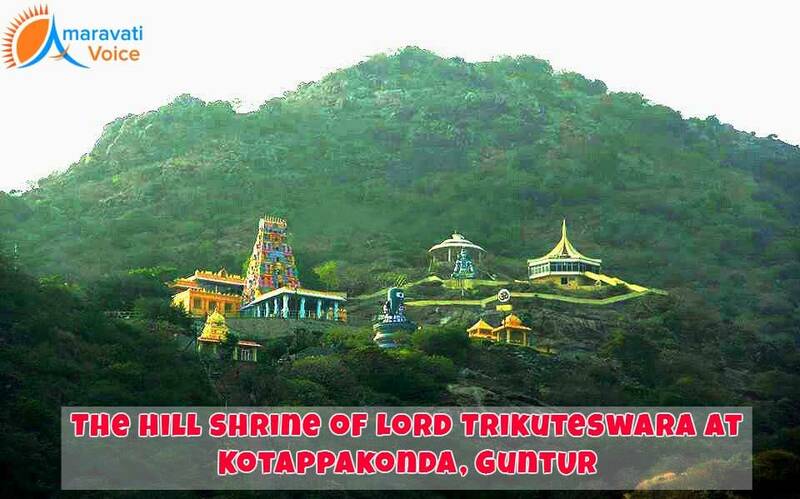 During your trip in Guntur District, when you search for holy spots to visit, there is the holy hill called as Kotappakonda. This is a popular temple hill for Lord Shiva and you will have to flight a stair way with about 1000 steps to see the Lord. When you see this hill from any direction, you will get to see three peaks and these three peaks are called as Brahma, Vishnu and Rudra. This is the reason why this hill is called as Trikutadri. There are four temples in the hill, one is at the base and other is at an elevation of 600 feet. The main temple is located at a height of 1500 feet and in the foot of the hill, there is a village called as Kotappakonda Village. Once, a lady used to regularly visit this temple to offer flowers and fruits to Lord Shiva. On her way to the temple one day, a crow disturbed her offerings that she was taking to the lord. She got angry and cursed that not even a single crow should be allowed inside the temple premises. This is stated to be the reason why even a single crow cannot be found near the temple. In addition, the priests tell a story about the temple. According to this story, the main lord in the temple used to reside at the height of 1500 feet. People were worshipping the lord and among the devotees, a lady was highly sincere in her prayers. The lord was highly impressed and followed her. Suddenly, when she realized that somebody is following her, she turned back and at that moment, the lord turned into a statue. This is why there is another idol for Lord Shiva at 600 feet in the Kotappakonda hill. On the eve of Maha Shivaratri, every year huge celebrations are done in this temple and more than 7 lakh people visit this hill at that time. This festival is referred to as Kotappakonda or Kotayya Thirunalla. Many people from nearby villages and towns throng this temple during Maha Shivaratri to get the blessings of Lord Shiva to lead a peaceful life and to get their problems resolved. When you want to visit this temple from Guntur, you can find buses operated from Guntur. Even, buses are operated from other areas like Chilakaluripet as well. It is not that all the devotees will have to climb 1000 stairs as there is bus facility to reach the temple from the foothills. So, plan your visit to this holy hill to get the blessings of Lord Shiva. If possible you can plan your visit on Maha Shivaratri day as well, but crowd will be huge.